Dr. Martin Goldstein | Dr. Marty, America’s high-tech, integrative veterinarian. Dr Marty, America’s foremost integrative veterinarian. Dr. Martin Goldstein, Dr Marty, is considered by many experts – and thousands of satisfied clients – to be America’s foremost integrative veterinarian. The results he has achieved have been so astounding that today critically ill dogs and cats from all over the world are brought to Smith Ridge Veterinary Center where doctors trained by Dr Marty give these animals a new chance at life and health. Many people who arrive have exhausted all of the available conventional treatment options and are faced with a very sick pet who is only getting worse; others are true-believers in a integrative-only approach to maintaining their animal’s health or treating their animal’s malady. Regardless of their reason for seeking care, they usually receive a mind-opening education about natural health that many ultimately apply to their own lives as well as to the lives of their animal companions. Integrative medicine does not truly define how Dr Marty thinks about or practices veterinary medicine. The simple idea he has brought to the profession is the powerful curative effect of combining the best of both conventional and integrative medicine. The term used is “integrative medicine” where both types of therapies are combined in a collaboration for health and against disease. 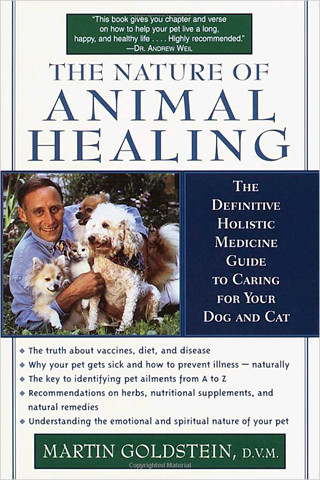 Through his book, The Nature of Animal Healing, Dr Marty provides advice on a wide range of practical topics central to a pet’s health including why we shouldn’t feed our animals commercial pet food or why vaccines can actually do more harm than good. When it is time to consider alternative therapies, the doctors he has trained at Smith Ridge Veterinary Center, where he is Medical Director, can successfully integrate treatments such as herbal medicine and homeopathic approaches along with the latest in high-technology medicine into an overall program for the sick animal. They handle every imaginable type of condition and they have earned a reputation for extraordinary success treating cancer and other serious degenerative diseases that are rapidly on the rise among animals as well as humans. Dr. Marty has been and continues to be on the forefront of deciphering the riddle of those killer diseases in order to show us how best to treat them, as well as how to prevent them from occurring. Dr Marty did not invent integrative medicine. He arrived there through a melding of his veterinary training and early onset health problems of his own. A classically trained veterinarian who earned his DVM at the Cornell University College of Veterinary Medicine, a conventional school long recognized as one of the best, Dr. Marty’s interest in integrative medicine was sparked several years after graduation when a variety of his own personal health problems were finally resolved using a natural, non-toxic approach. It was this life-changing experience that led him to commit himself to mastering the art and science of integrating integrative methods of treatment with conventional veterinary medicine. But there is a side to Dr. Marty not captured by his diplomas or his track record. He is a unique combination of “ingredients”. Clients who have had the pleasure of working with Dr. Marty often find him communicating with their beloved pet with light-hearted squeaky noises and exuberant touch in a private language only the doctor and animal seem to share. But both the humans and animals seem to recognize a special hope and healing in these non-verbal exchanges. Dr. Marty’s years of intense study and experience, coupled with his uncanny sense of intuitively “knowing” what is wrong with the animal, have allowed him to master the art and the science of diagnosis and treatment. He has been able to categorize what has worked for the thousands of animals he has cared for into an encyclopedia of natural knowledge. And fortunately, for dogs and cats and the people who love them, he has been able to pass along what he has learned to the doctors at Smith Ridge Veterinary Center. And to pet lovers everywhere through his book and seminars.